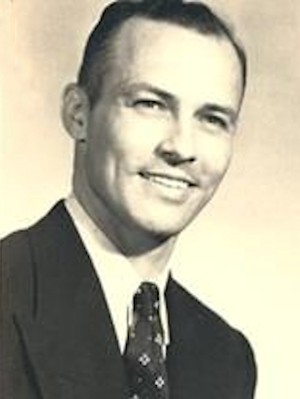 Obituary – Groom, Dr. Hal Edwin « Perry High School Alumni Association, Inc.
﻿- son of Mr. and Mrs. Duke Groom of near Perry, will attend the University of Oklahoma and study business and aviation. His hobbies include reading, mechanics, hard work and sports. He was in the senior play, on the wrestling team, in basketball squad, on the football eleven and in numerous other activities. He has clerked at the Corner Fruit Market during his senior year. He was born in 1921 in Perry and has attended Pike’s Peak school and Perry High School. Hal Edwin Groom was born on Groom ranch in Perry Oklahoma to Matthew Duke Groom Sr. and Ethel Florence Greening Groom on February 26, 1921. He was one of thirteen siblings and a twin to Hazel Edna Groom (Williams). She, at age 92, is still living in Connecticut, close to her son David. They were one of three sets of twins, and one of two sets who survived to adulthood. Growing up on the ranch they had many chores, but also loved to hunt and ride horses. All the Groom boys were involved with the Perry HS wrestling team, perennial state champs, and FFA junior livestock shows. Hal graduated from Perry HS in 1939 at age 18. 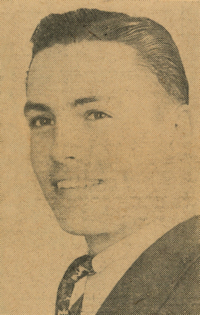 He attended OK A&M from 1939 to 1943, graduating with a BS degree in business. While there he attended ROTC, wrestled, and met Dorothy May Oldham at a freshman mixer dance at Murray Hall. They always loved to dance. While a student he worked for Vincent Funeral Home and drove an ambulance. After graduation he entered the Army Air Corps in April of 1943 and proceeded to Officer Candidate School and pilot training. He eventually got his wings and was qualified on multi-engine aircraft like the C-46. Hal and Dorothy were married Jan 13, 1945 at Post Chapel, Turner Field Ga. After the war, Hal was assigned in Korea to military government. They lived in Enid OK, Stillwater OK, and later St. Louis MO while Hal was attending dental school at Washington University. He received his doctorate in dentistry in 1954. He practiced dentistry in Tulsa for 50 years until his retirement in 2004. Hal kept his pilot’s license all those years, and Dorothy got her license as well. They took many trips in a 4-6 place Cessna. Another passion was boating. They kept a boat at the lake for many years and instead of retiring, they just extended their weekends a little longer each year. Hal and Dorothy sang in the church choir, and raised their five children at Rogers Heights Christian Church and were active teaching Chi Rho. Hal was preceded in death by his wife Dorothy, sister, Maxine Self, brothers, Glenwood, Max, Don, Lambert, and Buford Groom. He is survived by his twin sister, Hazel Williams, brothers, Matthew Duke Groom Jr., Keith Lloyd Groom, and Lynn Waldo Groom. Also surviving him are his five children, Stan Groom, Teresa Groom Leavitt (Don Leavitt spouse), Lynne Groom, Richard Groom (Lisa Groom spouse) and Edward Groom as well as grandchildren Brian Potter, Lisa Potter, Lucas Groom, Rebecca Groom, Julie Jarma, James Groom, Justin Groom, Joshua Groom, Madlyn Groom, Erin Blagg, and Logan Blagg. The great-grandchildren are Vivian Tewis, Xander Tewis, Ethan Groom, Nathan Groom, Heather Brown, Jacob Jarma, Cole Jarma and Mizmi Elora Groom. Hal and Dorothy danced at all the weddings. The viewing will be Thursday, Sept. 26, 2013, 6:00 to 8:00 p.m. at Moore Funeral Home, Rosewood Chapel, 26th and Harvard. Services for Hal will be held at Memorial Park Cemetery Chapel, Friday, September 27th, 2013 at 10:00 a.m. with a reception following in the Family Center at Memorial Park.